With a photographic memory and almost surreal diagnostic skills, my father was a physician with few equals. Born in 1911, when the physician’s chief concerns were to figure out what was wrong and whether you would live or die, Maurice Kamm Lurensky was the second of four children of Polish immigrants. He grew up in Charlestown, Mass., helping his father run a small grocery store. As a toddler, my father contracted diphtheria, a life-threatening disease caused by bacteria and the toxins they produce. The toxins cause membranes to form in the throat, and patients can suffocate. Apparently, my grandmother reached into his throat with her fingers to destroy the membrane, thus helping my father breathe. At that time, diphtheria was common: In Boston, in the early 1900s, there were 144 cases in a single week—just one measure of how much medicine has changed in 100 years! I know from the fact that my brother’s office phone is constantly ringing that he is, indeed, his father’s son, and that the gift has been passed to him. My father graduated from the University of Wisconsin in 1933, with plans to enroll at Harvard Business School and join the family business. Then, a week before classes were to start, he was accepted by Tufts Medical School, and he gleefully abandoned his original plans. 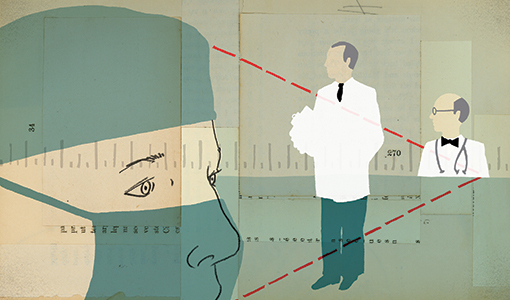 In his second year at Tufts, he anglicized his last name to “Laurence.” He received his M.D. in 1937 and began a residency at Boston City Hospital. Many patients there had tuberculosis. Indeed, in 1936, one in 20 deaths was due to TB, making it the most deadly of contagious diseases; my father was in the midst of this daily. Thankfully, he never got the disease, but neither did he forget what he saw on those wards. Years later, in the 1980s, young doctors at a famed Boston hospital struggled and scratched their heads, trying to diagnose strange symptoms in an 8-year-old girl. My father examined her, asked a few pertinent questions about the household and concluded that the girl had TB, infected by a nanny who had come from Jamaica, where the disease still persisted. This was but one example of his legendary diagnostic skill. While at The City, he met my mother, Elizabeth Zimmerman, a social worker. They eloped and were married in Brattleboro, Vt., in 1940 with $25 that my father got for giving blood. He bought her a simple gold band for $7; she eventually wore it out. Together, they raised five children. I was the oldest—his “experimental model,” as he called me. They settled in Swampscott, Mass, living in a wood-frame house with a broad front porch. At first, my father’s office was in the house; a separate entrance was created, turning what would have been the living room into a waiting room, examining room and office. I remember patients coming and going, and on occasion my trying to sell them lemonade from the porch. My father was clearly devoted to his family, but medicine was the dominant force in his life, and it sustained him after my mother died in 1982. With his office in Swampscott, my father was among the first internists to establish a practice outside the urban environs of Boston. He also started a 23-year stint as the company physician for General Electric in Lynn. His practice spanned more than 50 years. During his long career, he established the intensive care unit at Lynn Hospital, served as president of the northeast chapter of the American Heart Association and chief of medicine at Lynn Hospital. He embodied the changing roles of physicians as their ability to treat and to cure increased exponentially. My father’s final chapter began in 1995, when he suffered a major stroke. He could not return home and reluctantly chose to come to a nursing home in Hanover, N.H., to be close to me. He made friends with a few other residents and with most of the staff. In general, though, he kept to himself, a proud and dignified gentleman who won the hearts and earned the respect of all those who cared for him. He did suffer several bouts of serious illness, which he characteristically shrugged off with the proud pronouncement that he “had cheated the undertaker.” He died early on a Saturday morning, October 28, 2000. His genes are in us, and we are his legacy. While each of us carries some of his characteristics, one son, Robert Laurence, M.D., and one grandson, Laurence Brinckerhoff, M.D., are the direct bearers of this extraordinary medical torch. My brother Bob received his degree from Tufts in 1975, and after a residency at Newton-Wellesley Hospital, he settled in the Camden-Rockport area of Maine, joining the staff of Pen Bay Medical Center as a primary-care doctor in 1978. Thirty-six years later, the medical center has a staff of more than 100 physicians and is a full-service community hospital with 99 beds, overlooking the lovely Penobscot Bay. I know from the fact that my brother’s office phone is constantly ringing that he is, indeed, his father’s son, and that the gift has been passed to him. He has cared for such notables as Dr. Benjamin Spock and historian David McCullough, as well as our fifth-grade teacher from the Stanley School in Swampscott, Clara Waterman, after she retired to Maine. He has his own list of achievements, including a fellow of the American College of Physicians and chief of medicine and head of the Credentials Committee at Pen Bay. As his older sister, none of this surprises me. Late one summer afternoon in Swampscott, when he was only 3 or 4 years old, we were walking home from the beach, and we crossed the railroad tracks. Steam engines powered trains back then, always dripping water, and as we crossed the tracks, “Bobby” proclaimed that the train had already come by because the tracks were wet. His astute powers of observation were already fully operational. Larry, my son, may have missed the first step on the Tufts pathway, but he ended up there eventually. Larry chose to attend medical school at Dartmouth, graduating in 1994. After a residency in surgery at the University of Virginia and a fellowship in cardiothoracic surgery at the University of Colorado, Denver, he was appointed chief of thoracic surgery at Tufts Medical Center in 2004. He was always able to visualize in 3-D, quickly assembling complex equipment (such as barbecue grills), a skill that serves him well, as he tells me he will often “see” an operation in his mind the night before it is scheduled. It is not just motherly pride when I say that my son is also an outstanding and dedicated teacher. As an assistant professor, he runs the surgical clerkship for the third-year medical students and has won nearly every teaching award given by the school. Most recently, Larry was the inaugural recipient of the Outstanding Core Clerkship Director Award, given to a faculty member recognized by students as a great teacher and role model. Constance E. Brinckerhoff, Ph.D., is the Nathan Smith Professor of Medicine and of Biochemistry Emerita at the Geisel School of Medicine at Dartmouth College.